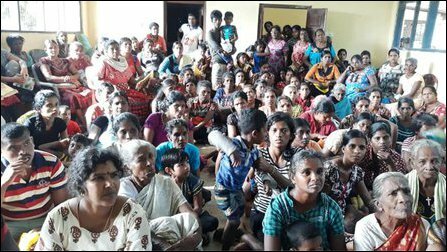 For the first time after 2009, the Eezham Tamils in the North managed to mobilise on their own without to provide immediate assistance to more than one hundred thousand people, who were severely affected in the floods across Mullaith-theevu, Ki'linochchi, Vadamaraadchi East in Jaffna and in the remote villages beyond the A9 road in Mannaar and Vavuniyaa. 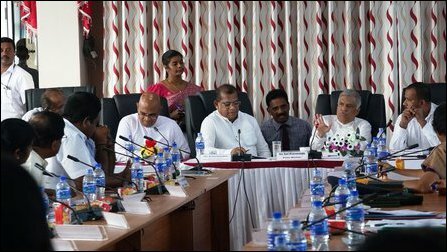 Despite some assistance through the hardworking Tamil civil servants, the attitude of the unitary state of genocidal Sri Lanka was, as usual, discriminatory and propaganda-oriented. 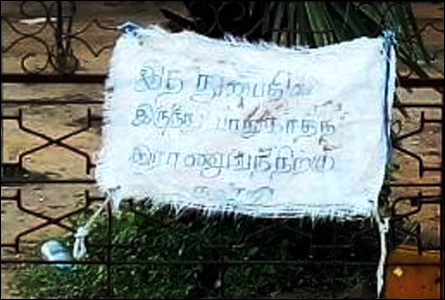 Also, the SL military which was duty-bound due to assist the victims of the flood, has gone to the extent of putting up ‘thanking note’ banners at several places, especially in Mullaiththeevu district, as if the people were thanking it for humanitarian assistance provided in the recent floods during which several thousand were affected. Sinhala soldiers are stationed in the North across the five districts at a ratio of one soldier per eleven civilians. This ratio is much denser in Mullaiththeevu district with one soldier per four civilians. One hundred eighteen thousand five hundred thirty-eight people belonging to 38,209 families were affected in the floods in the Northern Province since 21st December, according to the local administrative sources. 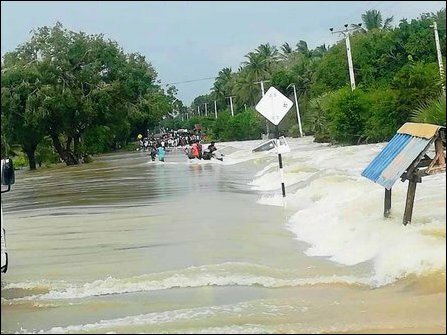 Ki'linochchi district tops the list with 74,730 affected people, followed by Mullaiththeevu (30,499 people) and Vadamaraadchi East (12,642 people) of the Jaffna district. Two people have lost their lives and two suffered injuries. One hundred seventy houses have been destroyed. Three thousand five hundred six homes have been partly damaged. Around 9,000 people belonging to 2,800 families are still staying in temporary camps. Many more people are staying with their relatives and friends. SL Prime Minister Ranil Wickramasinghe was visiting Ki'linochchi on Friday. 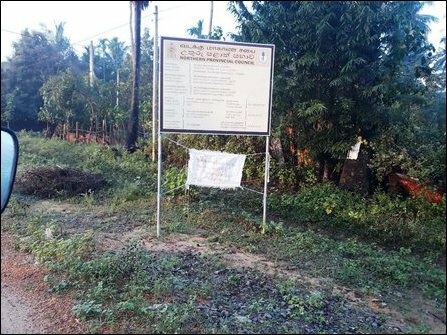 He was also promoting the SL military by handing over 200 water pumps for cleaning the wells, entirely discarding the criticism from TNA parliamentarians such as S Shritharan who hails from the district. 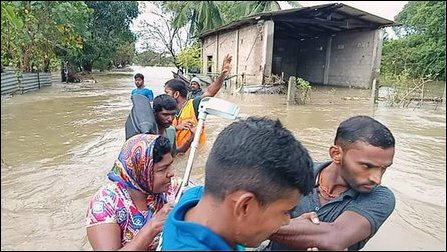 Wickramasinghe was only talking about insurance-type of ‘assistance’ apart from an immediate release of 10,000 LKR (55 USD) per family and that too for those who have lost their properties in the floods. It was mainly the self-mobilised Tamil youth through the social media and the grassroots organisations at the village level that mobilised to provide meaningful assistance also involving the role of the Tamil diaspora in the days that followed the disaster. 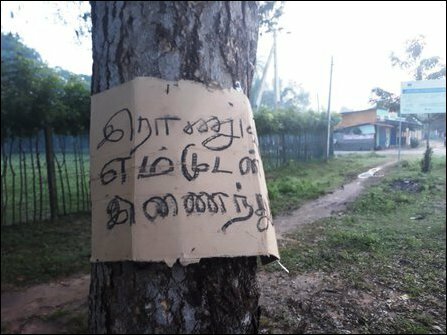 A so-called ‘civil-military’ officer of the SL Army, recently transferred to Mullaiththeevu from Jaffna, has sent photos of self-planted thanking note banners photographed from his vehicle in Mullaiththeevu to journalists in the North. As usual, the language on the banners is indicative of those behind the message and their psyops orientation.